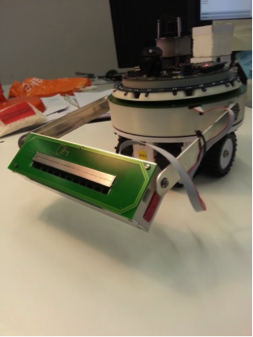 The group of marXbots robots used for validation of swarm algorithms in the ASCENS project has been equipped with a gripper module enabling collaborative manipulation and construction. You can observe just above the robot equipped with the gripper and below the CAD version of the module. The module is a magnetic gripper that allows taking ferromagnetic objects. It is based on a magnetic switch that can either attract the objects or not, depending on its configuration. To change the configuration, the magnet can be rotated inside a ferromagnetic structure that conducts the flux inside or outside of it, in respect of the magnet position.This generate an external attraction or not, allowing to grasp or not the objects. The switch between configurations is made by a motor. This gripper module has a total of tree degrees of freedom in addition of the magnetic switch. The first one is the rotation of the arm in respect to the body of the robot. This is important to precisely manipulate objects and structures, it is also primordial if you want that several robots grasp the same object and move it collaboratively. Sliding connectors allow rotating continuously. The second degree of freedom is the lifting movement of the arm. This degree of freedom is powerful enough to lift more than 100g and bring objects to a position higher than the robot size. The third degree of freedom is the tilt of the hand, for instance allowing to keep horizontal a cube used in the construction of walls. All degrees of freedom have position and torque feedback, allowing control in position, speed and torque. There are 22 IR proximity sensors on the gripper. 10 are located in front, 10 under and 2 on each side of the gripper. 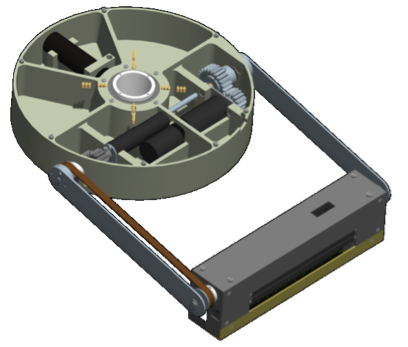 In the front of the gripper we have designed a RFID reader and writer, very interesting for the recognition of objects. On the arm there is a force sensor that measures the lateral bending of it.